You do not have to have read a lot of works by William Shakespeare (1564-1616) to be familiar with some of his most famous quotes. Many of the lines in Shakespeare's plays are among the most quoted in literature, and even the most misquoted. Shakespeare's works were filled with references to the highs and lows of everyday life, love and death, and are still highly relevant today, so you never know when a famous Shakespeare quote will be useful. It is our mind that judges whether something is good or bad, but in truth there is no good or bad. Do not talk just to talk. It is more important that when you do speak you tell the truth. Even if you don't believe you are great, you can achieve great things. Life is like a performance and people are like actors playing a role. There may be twists and turns in your path to true love. It shouldn't matter what a person looks like, you should love them for what's on the inside. If you love someone, how can you not have the courage to show that love? Asking for love can be good but if you wait for love to find you, it is even better. There is no greater love than love at first sight. If music feeds the feelings of love, give me more music. Lovers often overlook each other's faults. When you leave, so does my happiness and I feel sad. If you love someone, show it to them so they know your true feelings. When speaking about love, be sincere and speak gently with meaning. Not everyone who smiles at you is a friend. And you, Brutus? Julius Caesar said this to his 'friend' Brutus who played a role in Caesar's assassination. Avoid lending or borrowing money from friends as it could lead to trouble in the relationship. It takes a wise man to know who his child really is. A person can lose strength in character, or die inside, every time he runs away from a challenge in life. It happens all the time, everything that lives eventually dies. Death has come too soon, like a summer flower killed by an unexpected frost. It is easy to tell someone how to deal with grief until you are the one who is grieving. Is it better to live or die, that's the question. Is it more noble to put up with an unbearable situation or to take a stand against those troubles by putting an end to everything? I was looking for a fool and I found you, so I shouldn't be surprised. A lot of men have more hair than intelligence. I'd be happy if we never saw each other again. Listening to you talk makes me feel dumber. This line is commonly misquoted as "All that glitters is not gold." Both versions mean the same thing: Do not judge everything by its appearance. What you see is not always true. This line is commonly misquoted as "Bubble, bubble, toil and trouble." The latter appeared in the Disney show Duck Tales and may be the reason for this common misquote. The original quote meant that the witches were asking for twice the trouble and toil. This line is misquoted as "Gild the lily." The original line meant that someone is overdoing it or over-embellishing something that is already beautiful. This line is often misquoted as "Lead on, Macduff." The original meaning of this line is start the fight or go attack. The misquoted meaning is after you or you go first. 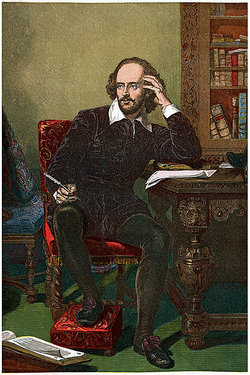 Many of Shakespeare's most famous quotes can inspire deep thought or strong feelings and be used in conversation or in writing. Whether you are looking for a witty comment or a thoughtful or loving line for a card or letter, quotes from Shakespeare are ideal to use as an expression from yourself to someone special. And for more great Shakespeare quotes, visit YourDictionary's quotes pages, where you'll find a wide variety of lines from the bard. "Famous Shakespeare Quotes." YourDictionary, n.d. Web. 20 April 2019. <https://quotes.yourdictionary.com/articles/famous-shakespeare-quotes.html>.